← Where are you Going to be Buried? The Aotearoa, the biggest ever vessel to be built for the Royal New Zealand Navy is taking shape and is ready for launch in South Korea. 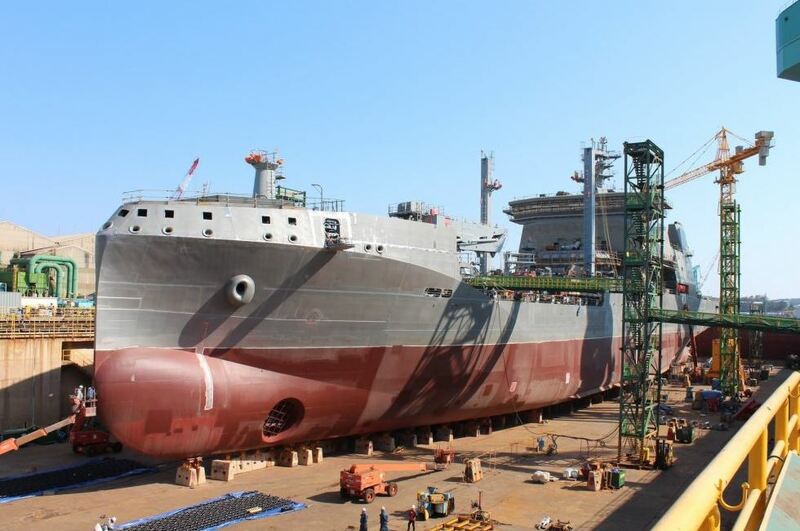 Aotearoa is being constructed at Hyundai Heavy Shipbuilding’s Ulsan shipyard and is scheduled to be launched within the next two weeks, according to the New Zealand Navy. The launch will take place some nine months after the tanker’s keel was laid in August 2018. Aotearoa represents the first of a new fleet of RNZN ships built specifically to address the global requirements of the New Zealand Defence Force and government agencies for deployment from Antarctica to the Arabian Gulf. Aotearoa is designed to provide logistical support to New Zealand and coalition maritime, land and air units. Featuring a wave-piercing hull form, the 173.2-meter-long ship will have the ability to carry twelve 20-foot shipping containers, high-capacity freshwater generation plants, self-defence systems, aviation and marine fuel cargo tanks, dual all-electric replenishment-at-sea rigs and will be able to carry a Seaspite or NH90 helicopter. Aotearoa will displace 26,000 tonnes and will be operated by a crew of 64. The ship’s $493 million price tag includes the tanker’s enhanced “winterization” capabilities, such as ice-strengthening for operations in Antarctica, including resupplying McMurdo Station and Scott Base. Her predecessor HMNZS Endeavour was not Antarctic-capable. Re-Antarctic operations: one would assume that the Phalanx system would be taken off prior to deploying to Mcmurdo as arms are not permitted on the Southern continent. Secondly, I believe that communications security equipment is also not permitted down south. Whilst serving on Endeavour (II) I was unaware of this until I befriended a Radioman 2nd Class on the USCGC Westwind. He told me that the US Icebreakers had to offload their Off-line encryption machines (KL7s) in Lyttelton, which were then held at Deepfreeze Headquarters, Christchurch. These machines were taken back on board when the ships returned to NZ, prior to leaving for the season. Delicate messages passed between ourselves and US Units had to have UNCLASSIFIED EFTO (Encrypted for Transmission Only – same as our Restricted, which the US didn’t have). I hasten to add that these Unclas EFTO messages couldn’t be transmitted in the clear over the air but had to be passed by hand. On the occasion that we were being towed out of the ice by the crotch method, I had to go to the bow and pass/receive messages to my counterpart, by hand! Likewise, I was not informed of this and went all the way with online ratt broadcast and offline crypto facilities onboard. Now, 50 years later, I learn about it! What you do not know does not matter! What used to “rattle my case” was receiving up to 500-1000 grouper to decrypt from ZLP broadcast WV. These messages were normally the latest intelligence reports originated from Wellington. Then arriving back in Dunedin from the Southern Antarctic waters seeing most of the content from these groupers appearing in the local paper Otago Daily Times for all to see!